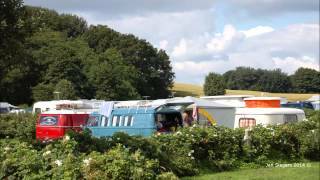 Gammelmark is a modern campsite with 289 terraced, level, grass pitches (200 for tourers), all with 10-13A electricity. Situated directly at the bay of Vemmingbund, in a hilly landscape, many of the pitches have great views of the Baltic sea. Fifty deluxe pitches are extra large and fully serviced. 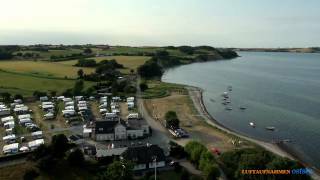 This site combines Danish hospitality with historical interest and various family activities are available, many involving nature and the history of the area when war was waged over the Bay of Sønderborg. There are several playgrounds, a child-friendly swimming pool and pets to make friends with. It is useful as a stopover on your way north, but is also a good choice for active campers. The site is close to the war museum in Dybbøl Banke. Gammelmark is also close to a Royal Palace, now lived in by Prince Frederick and Mary. When they are not at home it is possible to visit the Royal Gardens. There are several marked walking routes and opportunities for diving and fishing. The site has many green and energy-saving initiatives, which add to the enjoyment of your holiday. Two modern, heated sanitary blocks include toilets, washbasins in cabins, controllable showers and excellent rooms for children and disabled visitors. Baby room. Private facilities to rent. Laundry. Campers’ kitchen. Motorhome services. Shop (bread to order). Snacks (high season). Heated swimming pool. Play area. Children’s farm. Fishing. Riding. Sailing and boat launching. Diving. Beach. Daily activity programme (high season). TV room. WiFi (free). Torches advised. English spoken. From Flensburg take no. 7 road north and at exit 75 turn east towards Sønderborg. Take Dynt exit and follow site signs. Do not turn into house at 16 Gammelmark, but continue 200 m. down small road to reception.